It struck me at an odd hour last night, that despite the fact it's revamping a fair chunk of what I love about DC, I haven't really stuck much up on IADW about Brightest Day. Well that's about to change - from this point on every two weeks, I'll post one spoiler-free panel from the latest issue of the bi-weekly mega-hit right here. 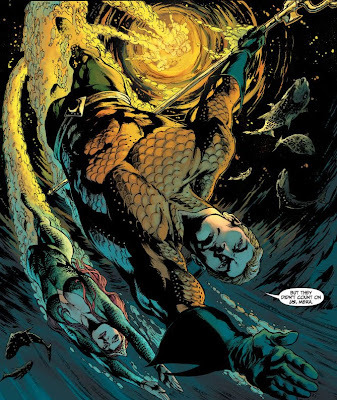 Starting with this awesome shot of Aquaman and Mera, from this week's issue, diving in to stop an oil mine leak from flooding the ocean (sound familiar?). I don't think I'll ever get tired of seeing the King of the Seven Seas in great splash panels like this! Thought you'd like that one Rob!